Varicose veins, typically found in the legs, are those that have become enlarged and tortuous due to malfunctioning valves. Veins have leaflet valves to prevent blood from flowing backwards; this backflow is called retrograde or reflux flow. The muscles of the leg pump the veins to return blood to the heart against the effects of gravity. When veins become varicose, the leaflets of the valves no longer meet properly, and the valves no longer work, a situation called valvular incompetence. This causes pooling of blood and enlargement of the veins. Varicose veins are more common in women than in men, and are linked with heredity. Other related factors are pregnancy, obesity, menopause, aging, prolonged standing, leg injury, abdominal straining, and crossing legs at the knees or ankles. Non-surgical treatments for varicose veins include elastic stockings, elevating the legs, and exercise. The traditional surgical treatment has been vein stripping, or removal of the affected veins. superficial veins: Those veins that are close to the surface of the body. Varicose veins are those that have become enlarged and tortuous, commonly affecting the legs. 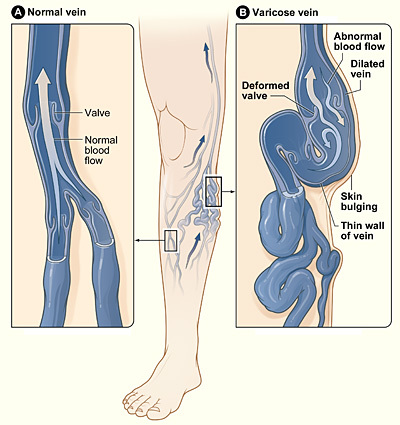 Varicose Veins: This image shows a normal vein with a working valve and normal blood flow. Figure B shows a varicose vein with a deformed valve, abnormal blood flow, and thin, stretched walls. The middle image shows where varicose veins might appear in a leg. Veins have leaflet valves to prevent blood from flowing backwards; this backflow is called retrograde or reflux flow. The muscles of the leg pump the veins to return blood to the heart against the effects of gravity. When veins become varicose, the leaflets of the valves no longer meet properly, and the valves no longer work. This change is called valvular incompetence, and it allows blood to flow backwards. To accommodate the retrograde or reflux flow, the veins enlarge even more. 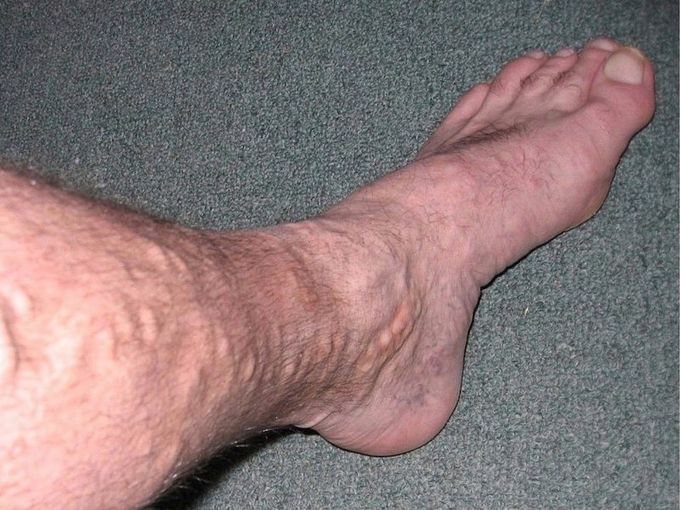 Leg with Varicose Veins: A man with many varicose veins in the lower leg. Varicose veins are most often found in the superficial veins of the legs, which are subject to high pressure when standing. In addition to cosmetic concerns, varicose veins are often painful, especially when standing or walking. They can often itch, and scratching them can lead to skin ulcers. Varicose veins are more common in women than in men, and are linked with heredity. Other related factors are pregnancy, obesity, menopause, aging, prolonged standing, leg injury, abdominal straining, and crossing legs at the knees or ankles. They are distinguished from “spider veins,” which are also due to valvular incompetence, by their size. Spider veins are less than one millimeter in diameter, whereas varicose veins are larger than this in diameter. Non-surgical treatments for varicose veins include elastic stockings, elevating the legs, and exercise. The traditional surgical treatment has been vein stripping, or removal of the affected veins. Because most of the blood in the legs is returned by the deep veins, the superficial veins, which return only about 10 per cent of the total blood of the legs, can usually be removed without serious harm.